Fear of frying: Why are youth shy to be creative in the kitchen? Cooking is healthy, so why are Americans cooking less than they used to? Maybe it’s because they are afraid to try. For me, mixing things together to come up with something new is exciting and rewarding. But my daughter recently told me that her junior high family consumer science classmates are afraid to try cooking because it might not turn out perfect. This is a common fear for adolescents. But a youth development program should help them to develop good decision making skills. 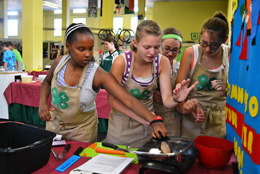 My favorite cooking activities for youth incorporate a cook-off. In team cook-offs, youth have to work together to make decisions. There’s no right or wrong answer; it’s a creative, learn-by-doing process that sometimes turns out better than other times. Food Insight has released a series of “Build Your Own” infographic recipes. Each one offers a simple recipe, with the option for variation. The series has six infographics ranging from oatmeal or a snack dip to fajitas and pasta. Each infographic recipe takes a step-by-step approach to build the end product and gives nutritional information. With fajitas one picks the protein, then the grain, vegetable and spice. The colorful infographic recipes would work well for a youth cook-off. My colleagues have blogged about Breaking habits and building creativity and The importance of imagination and play. Finally, to ensure your creative experience is a positive one, follow the experiential learning model. Participant(s) experience the activity—perform or do it. Participant(s) share the experience by describing what happened. Participant(s) process the experience to determine what was most important and identify common themes. Participant(s) generalize from the experience and relate it to their daily lives. Participant(s) apply what they learned to a new situation. Following this model offers a creative learning experience in which youth can understand what happened, see patterns, generalize from them and apply their learning to new situations. Studies show that with good set-up, cook-offs can raise youth confidence and attitudes toward food preparation. They may even try it again at home! Where do you encourage creativity and youth decision making in your programming? Thanks for highlighting that Build Your Own infographic resource, Carrie. The club I support in the summer time is just getting underway. I'll be glad to offer the youth leaders some ideas for how to make snack an educational and choice-making experience. How would you suggest integrating a cook-off into a community club environment? Are there any common issues or challenges we might want to know about ahead of time? Hi Erin - Excited to hear about summer time club programming! A community club can be a great place to conduct a cook-off. Since clubs often have varied aged groups within the membership pairing older and younger youth together in teams can help ensure a base food preparation skill level. Ensuring food safety is vital and the Partnership for Food Safety Education (http://www.fightbac.org/food-safety-basics/the-core-four-practices/) has some easy to use visual resources to teach how to clean, separate, cook and chill. If there is time for more pre-education, I'd encourage the youth leaders to lead the group in knife safety by chopping vegetables to make a simple salsa or demonstrate any other skills needed to make desired end product. Also exploring some of the nutritional information found at ChooseMyPlate.gov that align with the food products they are making available in a common pantry for all the teams to use will increase the likelihood of the youth being creative and using items they might not be familiar with. Good luck with your creative cook-off adventure!